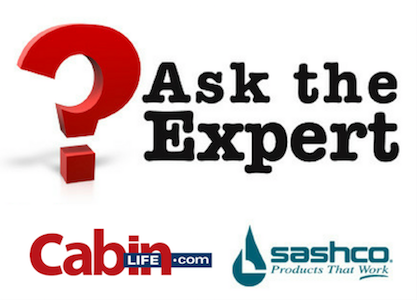 We've asked industry experts, Sascho Sealants to help us answer your questions on all things maintenance. Each month in our Cabin Life Newsletter we will feature our latest question. There are more stain types than just water and oil-based. Each has its advantages for maintaining your dream home. Each month in our Cabin Life Newsletter we will feature one question and answer. If you're not already receiving our weekly newsletter, you can sign up here. We'll archive all the questions on this page for easy reference and if you've got a question please email Amanda at aphillips@aimmedia.com. I'm buying an existing log home, not building a new one. What do I look for during the home inspection? Most traditional home inspectors are trained to look for problems with your HVAC systems, plumbing, or concreate foundation, and having those systems functioning properly is important. But normal home inspectors do not have the expertise necessary to check out a log home. Learn more here. We’re sure you’ve seen at least five different answers to the same question. That doesn’t clear things up at all. So, let’s first start with a moment of truth: there are more stain types than just water- and oil-based. Each has its advantages. We’ll talk about that in a minute. Learn more by reading the complete article. My log railings seem to take a beating every year. What can I do to help them last a bit longer? You're right - exposed railings really take the brunt of everthing. They get direct sunlight, sitting snow, freeze/thaw pressure, you name it. It's a lot for wood to handle! In this article, are four things you can do to help them last longer. Why do I need to back-brush stain I apply it? Unless you're using a deep-penetrating oil-based stain, wood naturally resists allowing stains to flow into the cells, preventing the stain from adequately protecting the wood. To learn more, click here. How soon after prepping my logs should I apply stain? Try to stain no more than a month after prep and preservative application is complete. To read the full Q&A, click here. Why is it important to use products specifically for log homes? When choosing which products to use for finishing and maintenance, start with specialty log home products. Skip the hardware or big box store products. They just can’t handle logs. To learn more, click here. Why is my chinking and caulking tearing down the middle and how do I fix it? The short and technical answer: cohesive failure. For more information on the causes and solutions, read the complete article here. I just took down some pictures from my log walls and the wood underneath is lighter than the wood around them. I knew this might happen, but how do I fix it? How do I avoid the same thing happening in the future? Ah, picture frame effect. You’ll see the same effect if you remove the trim on clear-coated cabinets. The area underneath the trim will be a much brighter, whiter color than the rest of the cabinet. Wood turns yellow over time on its own, due to both UV exposure and natural oxidization. There’s no stopping this from happening (but you can slow it down and hide it…more on that later.) Read the complete article here. HELP! My new log home is getting large checks and crack all over the interior and it was just built a few months ago. What's going on? What can I do to prevent the cracks from growing? As your new logs are acclimating to their new environment, they’re going to give up any excess moisture, causing them to shrink and move beyond what they can handle. All of that pressure has to give somewhere, and it usually means checks and cracks form. You’ll probably notice more of it happening as you turn on the heat. All of that warm air speeds up the rate of evaporation. The wood is forced to move more quickly than normal. The pressures keep coming! The good news: you can slow down the rate of evaporation and, therefore, the rate of cracking (and often the size of the cracks) by doing a few things. Continue reading this complete article learn more. What are the pros and cons of using a clear coat on my exterior logs and wood? We hear it all the time: “I want to keep my logs looking natural. I don’t want a stain” Indeed, there’s nothing quite like that fresh, blonde wood. Is there an easy way to keep the natural look over time? And if you do use only a clear coat, what are the pros and cons of doing so? Learn more here. How do I design my log home for lower maintenance? Most of the time, that dream home picture in your mind’s eye doesn’t include details like a three-foot foundation, or vegetation that is at least five feet away from the home. But if you’re going to keep your log or timber home looking the same in year six as it did in year one, while also reducing the amount of maintenance it needs overall, you’ll want to keep these design tips in mind. Read the full article here. Power washing is the most common method of cleaning and preparing log and wood structures. When done correctly, it will leave you with a surface ready to be stained. So, how do you power wash to get the best results for your staining job? Read the complete article for tips. Consider this a necessary crash course that will help you get things done right so you can focus on your actual bucket lis,t not on your caulking to-do list. Learn more here. What cleaner should I use before I apply a maintenance coat of stain? First things first: yes, you should clean your home before you apply a maintenance coat of stain. You need to remove dirt/dust, pollen, bird poo, mold, mildew, and other surface contaminants. Start with a clean surface. Check out the pros and cons of four popular cleaning products now. Beside their shape, how are logs different than a normal 2x4 (and why should I care)? You didn't choose a home make with 2x4's for a reason: any old wood just wouldn't do. Each and every log has its own unique grain pattern, knots, and history, just as your home has its own unique design and memories connected to it. Here are just three of the (very technical) reasons why logs are special. Learn more here. How much prep do I have to do before I stain? Perhaps the correct answer to this is not how much prep you’ll need to do, but that you need to do proper prep before staining, whether on a new log home or an existing one you’re re-staining. Proper means making sure these five pre-requisites are met before you apply stain. Learn more here.